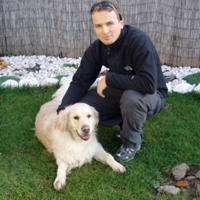 Igor Minar's Blog: Is Blockbuster Playing Fair? I just got an email from Blockbuster telling me that they are canceling my plan and I'll either get less for the same amount of money or I have to pay more to retain the current services. 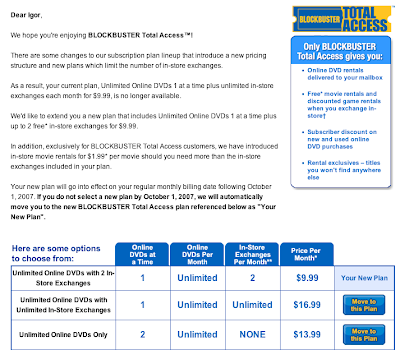 Blockbuster launched their Total Access program approximately a year ago. With this program online subscribers could return DVDs to traditional brick-and-mortar stores, and exchange them for free in-store rentals. Now Blockbuster is modifying this program to limit the number of DVDs one can rent. I understand that some can be abusing the system and renting many many many DVDs for little money. But for some reason, I have a feeling that all of this was just about hurting Netflix, their only real competitors, by taking advantage of their store network. And now when Netflix is bleeding, it's time to stop giving out DVDs for free and start cashing in. Taking advantage of assets to temporarily blind customers and not-so-temporarily hurt the competition, doesn't seem to be fair to me. Yes! I'm so glad someone has started talking about this! It is so completely unfair and underhanded, I can't believe they can get away with this. If we as bloggers can create enough of a stink about this, maybe we can get them to rethink! I don't really mind the new restrictions. What makes me angry is that they must have known that their "Total Access" program was not sustainable in the form in which it started. Instead of enforcing the limitations from the beginning, they were happy to hurt the competition in an unfair way, and in my opinion, in the end they hurt the customers as well. Are You a Right Clicka or an iBook Flippa? NetBeans IDE 6.0 Beta 1 is Out!